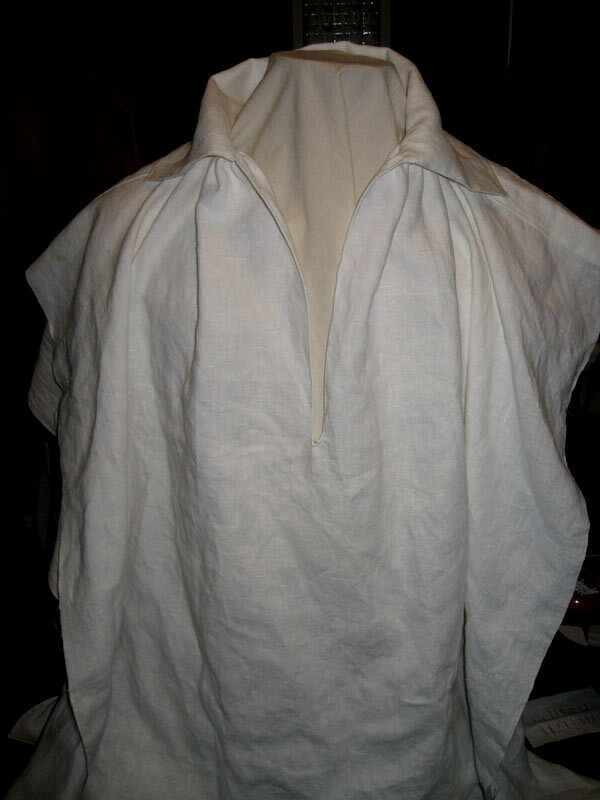 I've finished the neck and shoulders of the shirt, and have moved on to working on the cuffs and sleeves. 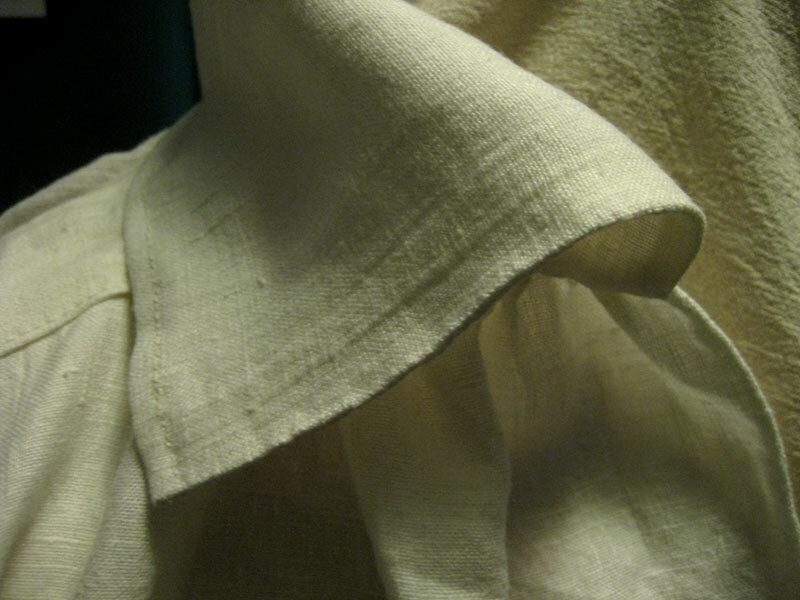 As you can see, the collar is fairly short compared to the amount of fabric in the neckline of the shirt, and all that extra fabric had to be gathered and pleated into the collar. 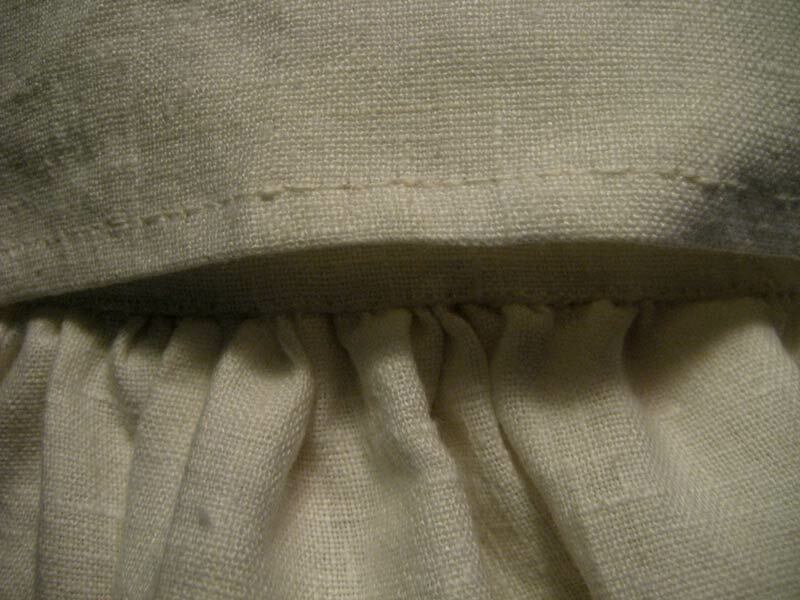 The main directions in the pattern said to backstitch around the collar before completing it, but then had a side note that period shirts usually just had the collar hemstitched to the shirt on both sides. I did that. It probably won't be as strong a connection, but I can't see myself getting into a wrestling match while wearing this shirt, so the collar probably won't be torn off. 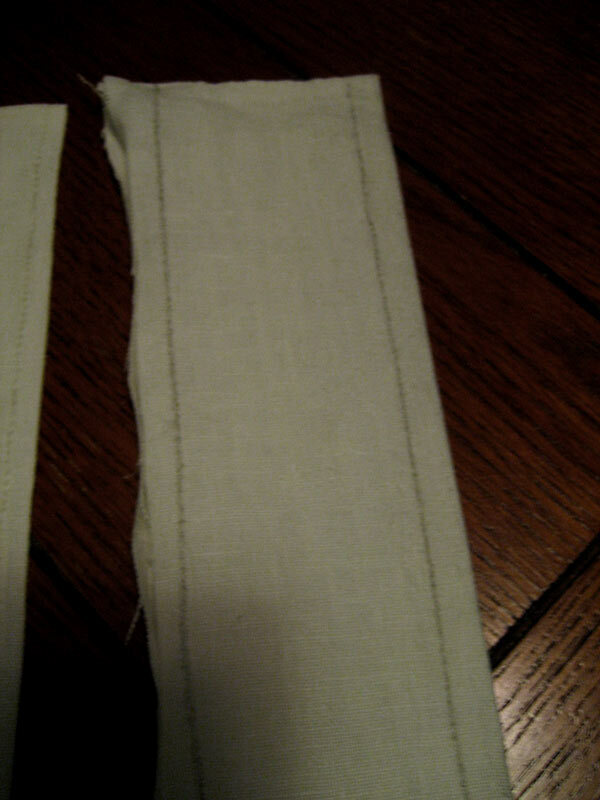 Below are the two cuffs for the sleeves. On the left, I didn't use any guides for my stitching and it went a little wonky.... For the other cuff I drew guide lines in black chalk, so my stitching is nice and straight. I just hope the chalk washes off - perhaps while taking a dip on Mr. Darcy's estate. I suppose at the very worst if it doesn't wash off I'll remove the cuff and make a new one. 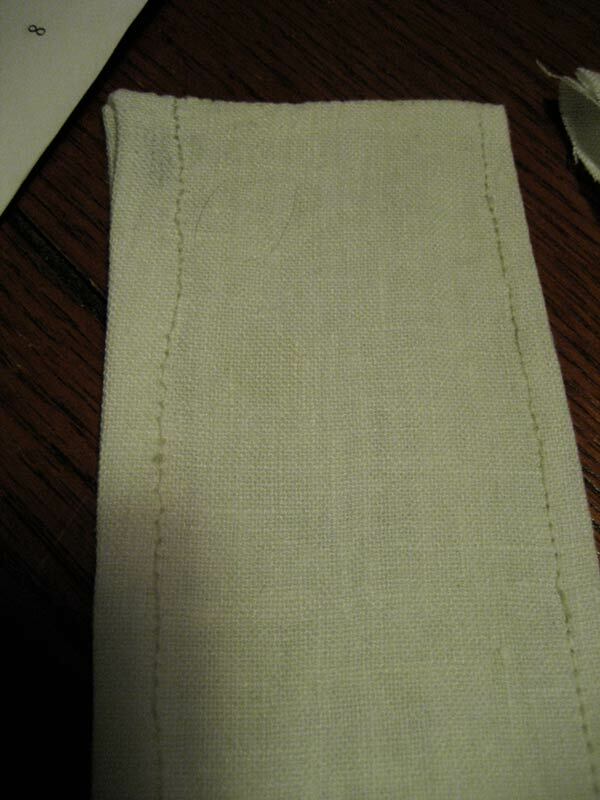 This hand stitching takes a long time, and I've pricked my thumb more times than I care to admit. If I were using a sewing machine this shirt would be long done by now. 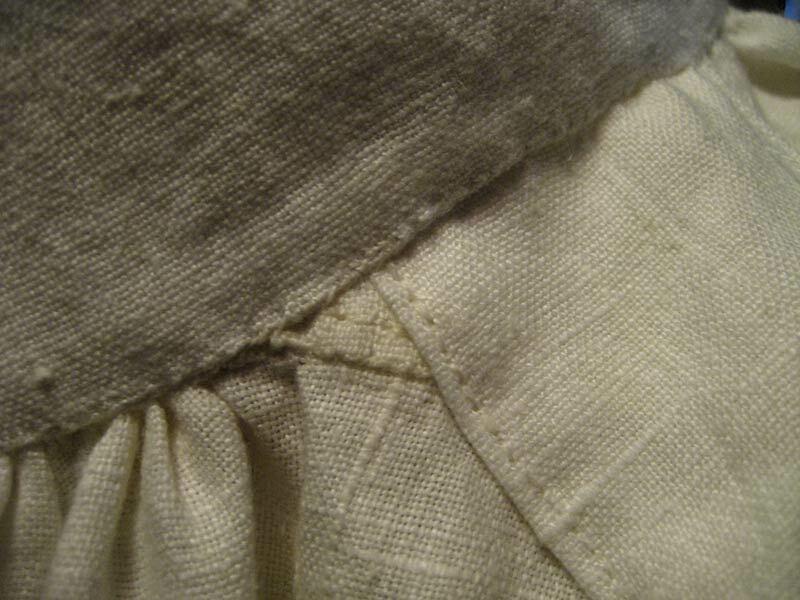 I definitely want to be able to say I made this entirely by hand, but I think in future projects I'll be just fine with using a sewing machine where possible - at least for long, not very visible seams. There's a lot that must be done by hand, especially when it comes to jackets (pad stitching the lapels, for example, which will be detailed when I make a jacket), and I actually enjoy making buttonholes by hand (not to mention that my sewing machine is absolute crap at making them automagically). 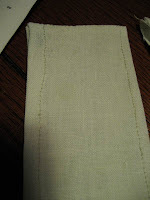 Try light blue or yellow chalk on light colored fabric. I am very impressed with your work. As a newbie too, I have been making a dress and know what you are aluding to with those long seams. Thanks for the tip - just one more thing to add to my wish list. :) For Regency sewing it's also very proper to pull a thread to mark the sewing line. I probably should have done that here - a simple way to mark a straight sewing line.